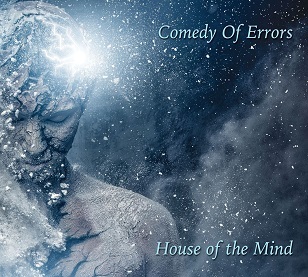 Comedy of Errors - New Album House Of The Mind - out Now! CD album - Out now! The CD release features 5 new tracks plus as a bonus, the band have re-arranged and recorded the classic "Ever Be The Prize". Digi-pak with 12 page lyric booklet. Order from our website shop, or you favourite CD outlet. The vinyl release features the 5 new tracks. A lyric sheet is enclosed. To make sure vinyl purchasers don't lose out a House Of The Mind CD album (in basic slip case) is enclosed free of charge in all vinyl copies. Pre-order from Burning Shed. Burning Shed have stock and are shipping now!. House Of The Mind album sampler - Listen Here!